I want to live to a ripe old age. Reaching centenarian status could be ambitious but 90 or even 85 will do just fine. But, for me at least, more important than the numbers of miles on the clock, is getting right to the end in good health – fully mobile, mentally sharp and free from modern diseases. I saw my own grandmother pass away in just her mid 60s – caused by many years of heaving smoking. From memory during her latter years she could barely leave her armchair, or even breath properly for that matter. She was in and out of hospital and even had one of those stair lift machines installed at home. My mother by contrast is in her mid 60s and is as fit as a fiddle. I’m sure one of those biological age tests would confirm that she’s way younger than her chronological age. All of this brings me to food. One of life’s greatest pleasures. But also one of the key influences on how long we live and whether we’re disease free and fully functioning in our 60s, 70s, 80s and beyond. This fantastic quote comes from The Longevity Diet, my latest book purchase. I had to order a copy. Not least because the author is donating all of the proceeds to research. Professor Valter Longo is one of the world’s leading experts on aging and his book is based on decades of research, including research into the world’s longest living populations. In a nutshell he shares how the secrets of longevity lie in food. I’m not sharing those secrets here, but it’s fair to say they’re not rocket science. Like following a plant-based diet and eating what our ancestors ate. Here I’m sharing a recent kitchen creation that I think Professor Longo would approve of. Why? Because it’s free of animal products and refined sugar, contains good carbs (yes he’s pro carbs!) and a dose of veggies. This loaf is perfect for afternoon tea or as a snack. The same mixture could be used to create muffins instead. And you could replace the pear with apple. 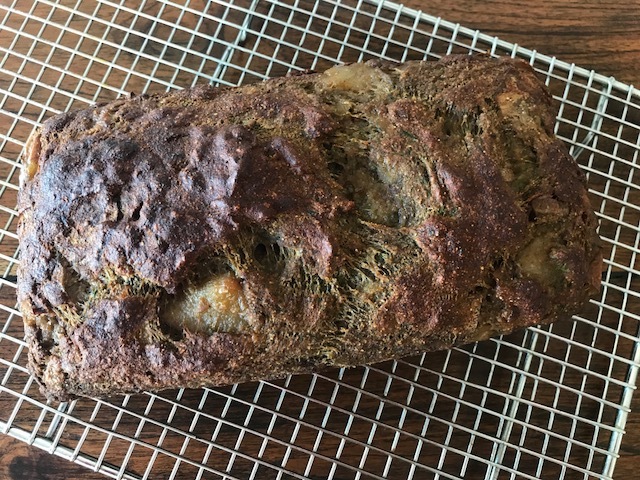 *I used green banana flour because it’s packed with resistant starch (check out my recipe for banana bread for more info on banana flour and the gut boosting benefits of resistant starch). Roughly chop the pears into chunks (perhaps 10 per pear) and add to a baking dish. Roast in the oven until soft (roast covered to retain the juices) for around 45 minutes. Once soft allow to cool – don’t blend them! Soak the chia seeds in ½ cup of water and soak for 15-20 minutes, stirring a couple of times. At the same time grease and line a loaf pan with baking paper and pre-heat the oven to 180C. Add all of the dry ingredients into a bowl, sieving the flour. Add the wet ingredients into a bowl – the chunky pears (plus around ¼ cup of the pear juice), shredded zucchini (squeezed of excess water), chia eggs and vanilla essence. Mix through. Make a well in the dry ingredients and then pour the wet ingredients. Use a spatula to gently fold the mixture. Tip the mixture into the loaf pan and bake for 45-50 minutes. Allow to cool and transfer to a wire rack. I’m always on a quest to educate myself on health and wellbeing and prefer a good book over getting snippets of information here and there from the internet. Let me know if you’d like to know any other book recommendations! Tags: bread, loaf, muffins, pear, vegan, zucchini. Bookmark the permalink. Great recipe. Check out my blog when you have a chance. 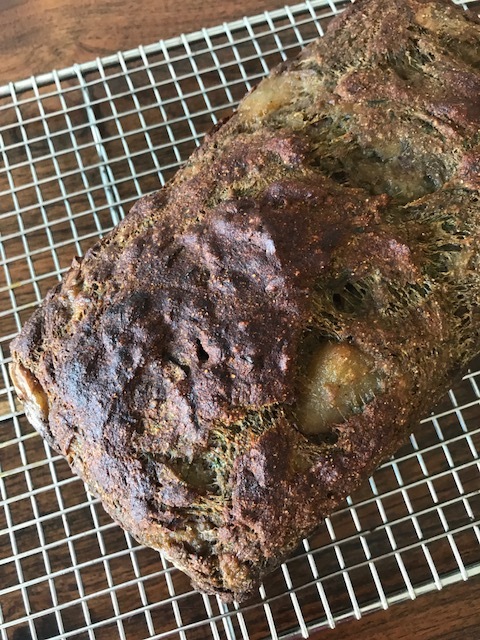 Thanks Petra – banana flour is gluten free and super nutritious – very high in resistant starch and so good for our gut bacteria. I buy an Australian product but I’m sure you’ll be able to track some down in the UK! Hi petra – that’s the brand I use and the back story on how the company was founded is really inspirational……sounds like your flour will be en route from Australia! This is such a healthy and yummy recipe.I like the use of chia seeds and pysillium husk. I have never used raw banana flour and I want to try it as I love the flavor of raw bananas in Indian dishes. Hi Sandhya, thanks for your kind words. Banana flour would be so versatile to use in Indian cooking. It’s gluten free and also so good for us – you can probably source some locally I would imagine…..although I wouldn’t stay that it tastes overly banana like! I will look for it in and try it for sure, Laura. Fantastic post and recipe. We’re on the same wavelength as far as health and food are concerned. Yay! Thanks Annika – it’s a good wavelength to be on!